Colibri 1.8.6 is now live! As of a few moments ago Colibri has been updated to version 1.8.5 with the update prompts appearing shortly for everyone through the Mac App Store application if automatic updates are disabled on your system as part of the somewhat steadier (and albeit slower) release cycle that I’ve adopted recently – this concludes the Winter Update. This patch has been long coming in a sense that a few critical (and nasty) bugs were finally fixed and the frequently requested MOD/MIDI support has been implemented – you can read the full changelog here. 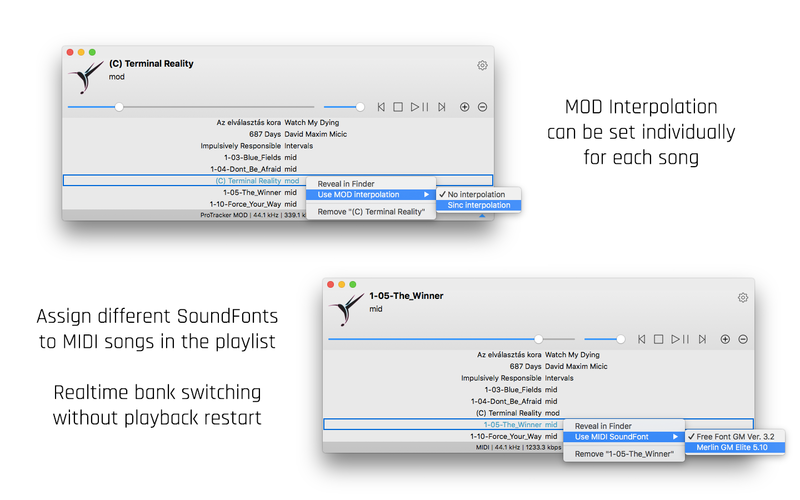 At the end of the previous post I’ve mentioned a customization option that I haven’t seen in any other player so far on macOS and that turned out to be the per song adjustment of sample mixing in the case of MOD music files, whereas in the case of MIDI files it is the per song SoundFont attachment – all with realtime bank switching and quasi uninterrupted playback as the playhead maintains the current position within the song. MOD sample mixing and MIDI SoundFont assignment in Colibri – per song! Just after submitting the finalized update to Apple for review I’ve got an email regarding a crash that happened just as Colibri would start up: it turned out to be one of those bugs that I had been chasing around for a while now but never managed to find the correct environment to reproduce it. I’ve instantly pulled back the update to address the issue which in the end translates to less Sandbox Permission asking dialog boxes popping up when you add new songs. For those of you trusting Colibri by allowing top level access to your music collection, this issue shouldn’t really have come up as it affected the negotiation part of handling different permission bookmarks for folders and songs simultaneously. Once again, thank you for your continued support, it truly means a lot! The great majority of feature requests via emails/reviews/comments I’ve received so far have been added to the roadmap and will be implemented in the future. What’s high on the TO-DO list? Currently, the equalizer and a better playlist so please look forward to those in the near future. That’s it for now, take care and happy listening!